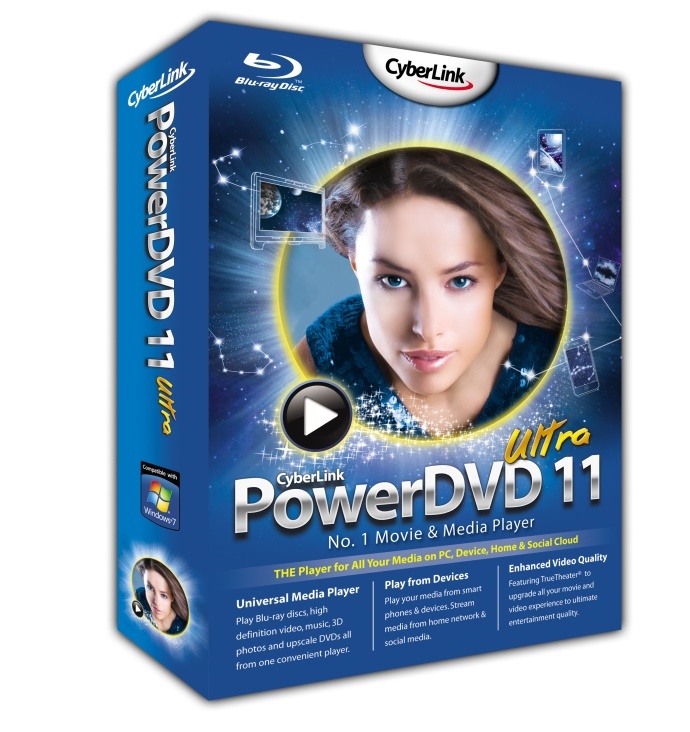 Today CyberLink officially released their new PowerDVD 11 media playback software for PC with the new version being announced as an universal player that is designed to be the only application you’ll need to view Blu-ray and DVD movies, videos, photos and listen to music. PowerDVD 11 comes with a lot of new features including support for playback and transfer of content from iPhone, iPad, iPod Touch and Android phones and tablets to PC. In addition to support for media from smartphones and tablet devices, the new PowerDVD can also play from remote media sources such as DLNA servers and popular social networking sites such as Facebook, Flickr and YouTube. Furthermore PowerDVD 11 users owning an iPhone, iPad, iPod Touch or Android-based devices can download and install the PowerDVD Remote application that will turn their mobile device into a remote control for the PowerDVD playback functionality tight from the comfort of their sofa. Among the interesting new 3D-related features you will get in the top version of PowerDVD 11 are for example: Playback of recorded 3D TV (ISDB-T Standard), 3D Photo support (MPO/JPS), TrueTheater 3D functionality for for photos including ones from Facebook and Flickr, and the ability to Upload 3D video to YouTube. I’ll be doing a review of the new functionality added in the PowerDVD 11 Universal Media Player in the next few days, so expect more information about the new version of the PowerDVD media player very soon. – Play any HD media: Whether it’s Blu-ray, upscaled DVDs, videos or photos, PowerDVD 11 can play them all flawlessly with optimized CPU/GPU hardware acceleration. And new ultra-fast Instant Seek lets you search for movie scenes in your DVDs in a flash. 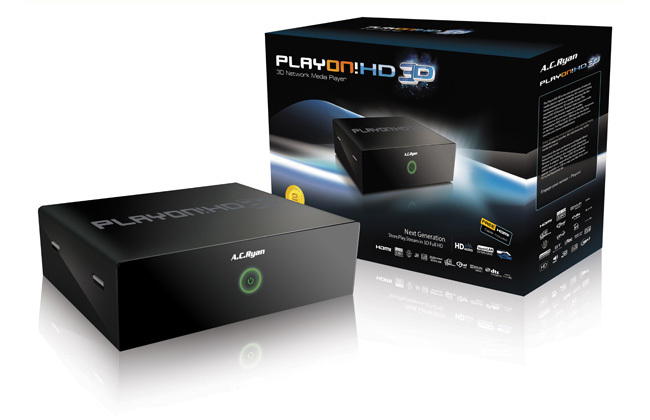 – Play any 3D media: Experience the hottest new movie and video technology with Blu-ray 3D and native 3D video support. You can even convert your 2D DVDs, videos and photos and enjoy them in 3D. – Play media from anywhere: From Apple and Android devices through to online media, DLNA server content, and Blu-ray and DVD discs, PowerDVD 11 plays it all. – Play in upscaled quality: CyberLink’s unique TrueTheater enhancements allow you to upscale the image quality of your movies, videos, while TrueTheater Surround gives you a surround sound experience using only stereo speakers. – Play social media: Watch TrueTheater-enhanced video from YouTube and view Facebook and Flickr photos and slideshows all from the one application. Easy, convenient and a great time-saver – no more searching! As I’ve already mentioned, the player is a commercial software, but you can download a trial version and test it for 7 days, before deciding to stop using it or purchasing a license. So I did download the trial and ran some videos through the player to see how well it will perform and try its features. What I can say is that for certain the player offers some nice touches that are missing in the free 3D Vision Video Player, but on the other hand it is also missing some of the more advanced options available in the free 3D Vision Video Player as well. The Movavi 3D Media Player is not so flexible on the type of 3D formats it can support as input, may have some issues with half horizontal Side by Side videos regarding the use of the correct aspect ratio as compared to the 3D Vision Video Player. 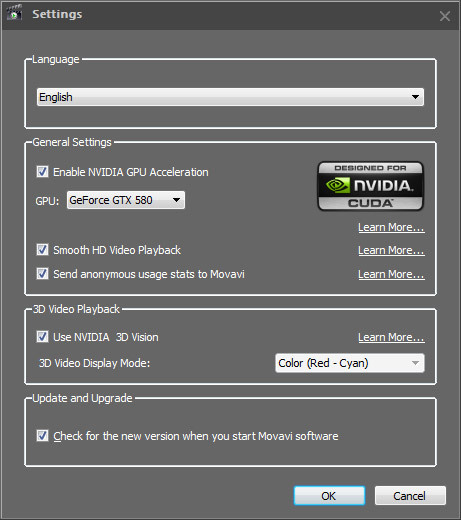 The Movavi 3D Media does not have a graphical command menu overlayed when in 3D mode, or a right click menu with options for easier control, so you still have to switch to windowed mode change something and then back again in the full-screen mode. The last option is something that might’ve justified the purchase of the software for some people, but the lack of such features for a commercial software that also needs some further development may as well keep you a happy user of the free 3D Vision Video Player. Another thing that might be good for some not so advanced users is the fact that Movavi 3D Media Player is handling better with the support of different containers and codecs for the video files, less problematic than the 3D Vision Video Player, but also does not have the advanced filters and codecs tweaking menu that can also be quite helpful if you are a ore advanced user… especially regarding the use of additional DS filters. In general I was not so pleased with the Movavi 3D Media Player so that I would recommend it as a replacement for something that you get for free, namely the 3D Vision Video Player, but it does also have its appeals. The normal price of a personal license of $44.99 USD (there are occasional promos with big discounts, currently available for $24.99 for a limited time) is something that I won’t be paying for the software at its current stage of development, but if the company keeps up adding features and improving the player it a few months it might become a good alternative of the free player. But you better try the player by yourself, as I said you get a free trial for 7 days which should be enough for you to compare it and decide for yourself.